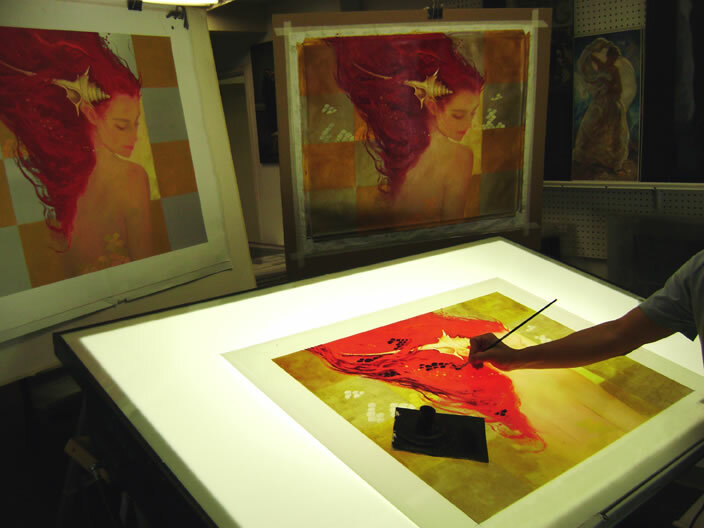 Serigraph fine art printing was the initial business for Kolibri Art Studios. Sergei Lazutin, master printer and owner, is considered one of the world's most accomplished serigrapher’s; he has collaborated and worked closely with many world-renowned artists. Sergei is well known through out the United States, Europe and Asia. Artists and publishers travel to California to specifically have their work printed at his studio. Below you'll see Sergei's work done on a Felix Mas serigraph. 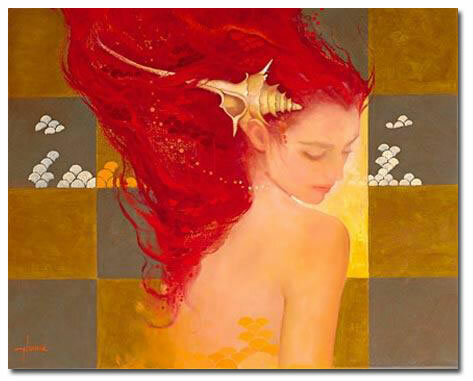 This particular project was printed for Chalk & Vermilion Fine Art, in 2008 and it's titled "Sirena". In the serigraph process, Sergei and his chromists (hand color-separator artist) use black ink on clear acetate to create stencils that will isolate each one of the colors in the original to be reproduced on paper, canvas and/or panel. This whole process required 2 months and 78 colors in the making! Kolibri has printed as few as 4 separate screens and as many 200 screens to complete a serigraph. Each project has its own challenges, and Sergei’s expertise allows him to predict and understand the complexities of each piece and efficiently plan production to achieve the best match to any original. Since all serigraph editions are custom print projects, always submit the image for pricing to determine the number of colors to be printed. We will determine the number of colors and upon confirming the availability of the required substrate, than we able to provide you a quotation in writing. At all time we require the original to be in our possession (if available) until the edition is completed. The pre-press requires that the original art work will be scanned by Art Scans for accurate reproduction. We can also accommodate transparencies at all sizes. Our quoted prices include printing on US made Fredrix brand 4 times acrylic primed serigraph canvas or 100% cotton, archival quality Coventry Rag or Museum Board art-papers at various thickness. The average production is 6-8 weeks. Other substrates can be arranged, such as Gesso Board, wood panel, aluminum and requires special price quote. Depending on the edition size, you can save a considerable amount of money by printing the project in the serigraph process rather than digitally. The unit costs can be lower on a serigraph edition depending on the number of prints involved. Kolibri Art Studio is able to customize your printing project to your needs and explain the differences and advantages between digital print-on-demand and serigraphy, and we will advise you accordingly. For more information or custom quotes contact Bernard Fekete, General Manager, direct at Kolibri Art Studio, 310.538.4855.